Wednesday was a tough day. A rather silent trip to the airport ended my mom’s two month stay in Coeur d’Alene. Her presence for the birth of James was so special and her companionship and help during the subsequent weeks was a huge blessing to our new family of three. Though I’m feeling a bit bereft in the wake of her absence, her departure has made me realize a few important things – permit me to share some conclusions? There’s nothing like having your own children to make you appreciate your mom. I’ve never been short on appreciation for my momma, but being a mom now makes me marvel at mine. I find it difficult to squeeze in a daily shower, but she was a working, single mom for six years and did both with aplomb! She was/is a an abundant source of love and encouragement, which was so evident in her joyful service to us as we welcomed James into our lives. I hope to model that same attitude for my own little family. Raising children should be a community effort. We live in an individualistic society that puts so much emphasis on being self-sufficient and independent. That attitude can stifle our ability to ask for help. As parents, we have the weight of responsibility for bringing up our children, and that’s a tough job! We need to feel free to admit we struggle and need others to share that responsibility sometimes. It’s not a sign of weakness to accept support from others, it’s a sign of wisdom. Parenthood is another opportunity to leave and cleave. I’m super tight with my family so the initial leaving and cleaving when I got married was a bit difficult. Had God not put 2,500 miles between us, I would probably still have cleaving issues. Having a child requires a different type of leaving and cleaving. Tim and I are growing and stretching as a couple to accommodate our new addition. Our family has expanded and that requires a regrouping of sorts. I’m no longer just someone’s baby – I have one! Though I will always be my mom’s baby, I’ve added mother to my own identity and that changes the dynamics of our relationship. In all things, there needs to be a sense of gratitude. I could spend way too much time bemoaning the fact that my mom is gone or that the transition is difficult, but that detracts from the joy of the past two months. What a gift! I would hate to diminish it by focusing on the negatives. Some women embrace motherhood. Others are embraced by motherhood. But either way, it changes all of us in ways we never expected. One very difficult aspect of life with a baby is not operating on full cylinders. Sleep is in short supply, making your body tired and your mind weary. I could deal with the physical ramifications alright if only my brain would function properly. For an internal processor, lack of sleep means less energy to, you guessed it, process! When my processing is truncated, my hormonally driven mood swings are magnified in an unflattering manner. If something tousles with my routine or my ability to care for James, I can’t properly think things through. I don’t have time to journal about it (because, really, my extra time should be spent sleeping), and I don’t have the mental wherewithal to sort it out while I’m on the go before it effects my relationships and attitude. If I choose to think or journal instead of sleep, my family suffers at the hand of a mom short on patience and a wife short on warmth and grace. Part of the problem is my inability, or unwillingness, to just BE in this season. And not be something I’ve concocted out of unrealistic expectations. I haven’t been allowing myself to just be, for better or worse, in the imperfections of this stage of my life. I’ve expected myself to be a well rested, well processed person again and I’m finding that close to impossible. Maybe if I weren’t also expecting myself to remain well read, well nourished, and well exercised (for the sake of parallelism, we’re going to let that one slide…). Those things take a kind of effort that I am short on right now. I am constantly striving, stretching, and pushing to meet those expectations that I’ve missed the sitting with this season – the being. Why struggle when I could just BE – be a mom who lets go of guilt and unreasonable expectations. Who is reconciled to having an unmade bed. Who goes for a 15 minute walk around the block instead of getting to the gym every day. Who is okay with being 10 pounds heavier than she would like instead of constantly hungry and sore. Who is fine with being a consumer of blogs instead of a producer. Who is okay with being behind on her reading list because she read five board books in a row. Who is okay with being unshowered and sloppy in order to catch a few winkies with the baby. Who is okay with being attentive to God’s presence in the everyday instead of forcing a traditional quiet time. Who is okay with being in-process instead of processed. I want to be a mom who is finding joy in just BEING a mom. Just over five weeks ago, a miracle happened. A new life entered the world with gusty cries and flailing arms. I gave birth to a pint-sized person who forever changed my life on that day. Our family is now one person bigger. Our room sleeps three instead of two. Our bodies produced another body who is now flesh and blood among us. And like with any other extraordinary occurrence, the wake of this miracle has changed more than just the physical. I have a new role, new responsibilities, and a new routine. My house is in constant need of picking up. I’m still wearing my maternity jeans. My mom makes most every meal. I have to be careful about bouncing too much during Zumba or I just may wet my pants a little. My hair sees more spit-up than shampoo. I cry for joy at the thought of 3 hours straight of sleep. My thoughts are barely coherent and they most certainly don’t get written down in my journal. But, ever since that miracle happened, the one so full of hope and joy, I’ve been striving to get back to the old normal. I strive like there’s some magical moment when life will return to its usual stride. I strive like after a certain amount of weeks James will just be an add on to the old normal. In the old normal, I could keep my house clean and have dinner on the table when Tim got home from work. I fit into skinny jeans that didn’t have an elastic waist band. In the old normal, I could jog a 5K without feeling like I got run over by a semi truck the next day. I had time to process, journal, and share regularly in this space. While I’m sure some of those old normal habits will return in time, I’m not sure making that my goal is wise. Specific goals get in the way of healthy adjustment. They can take the focus away from progress and place it on results. 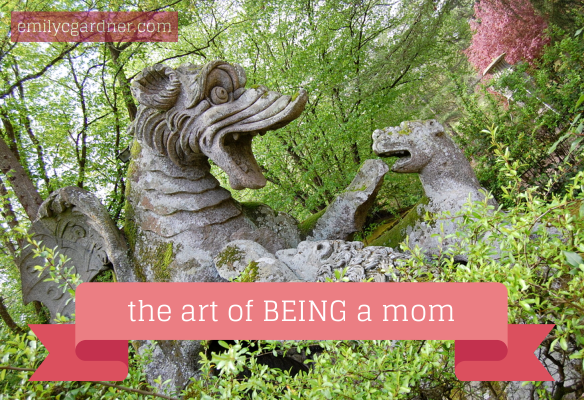 Adjusting to motherhood isn’t some black and white event with a definite beginning and end. It’s all a messy, grey process. I can’t just arrive at adjustment like my little one arrived in the world – hard and fast with a wail and one final push. I need to define my new normal by how I engage the process instead of the outcome. So, I walked a 5K at the gym. I napped instead of vacuuming because I’m a better mom and wife when I get enough sleep. I read a board book instead of a novel. I haven’t started a strict diet so my body makes enough milk. I’m participating in the process of my new normal. I don’t want to miss out on the nuances of this season because I was consumed with the past. I don’t want to fight the changes involved with motherhood, this miracle. I’m so pleased to have Allie from Days Like These on the blog today. Her post is super timely for me… I love her suggestions! You can find more great advice on her site, which is full of wonderful posts for moms and book lovers. Without fail, there will be many days when you have a plan to do something and your baby is still sleeping, needs to sleep, or is extremely fussy the second you pull out of the driveway. This is a highly frustrating experience, especially if you are at the point where saying hi to the mailman is your most exciting adult interaction all day. I used to pride myself on being on time and thinking annoying thoughts like “being on time is late.” Welcome to Motherhood—where you are never on time for anything, if you even get there at all. On days like these, give yourself lots of grace, snuggle your baby while they sleep on you, eat some chocolate and watch your Netflix queue. What are your favorite inexpensive ways to get out with a new baby? Allie Rasmussen is a Denver-area wife, mom, and naptime writer. She blogs about life, the hilarious antics of her one-year-old, and books at daysliketheseblog.com. James is here! Today was his actual due date, but he came two weeks early. I have enjoyed having 14 extra days of baby snuggles, however, the learning curve with a newborn is steep. Even though the past two weeks have been full of joy, they have also been full of adjustment for our little family of three. Here are some notable takeaways from our first two weeks with a newborn. I see a couple Bible stories in a whole new light. Much of my pregnancy hormones (I’ll talk about those later) have channeled themselves into anxiety and fear. I was virtually paralyzed putting him in his cradle the first night Tim and I were alone with James. Was he still breathing? What if he choked and we didn’t hear? You get the idea… My mom reminded me that [pullquote position=”right”]God has a special place in his heart for moms and all our emotional nuances[/pullquote]. On the cross, Jesus took specific care of His own mother. He know’s our worries and instead of dismissing or discounting them, he empathizes and pays particular attention to our needs. I also have a new found respect and awe of Abraham’s faith when he took Isaac up to the altar, knife in hand. I love Jesus, but I’d be hard pressed to do anything to harm James, even if God asked me to. Wow, Abraham for trusting that God had a bigger plan. Wow, God for sacrificing His own son on our behalf. People say it all the time, but it’s true – you don’t know how much you will love your baby until they are in your arms for the first time. The depth of love I feel for James is overwhelming. Hormones are a raging bull. (I had originally chosen a more choice B word, but bull works.) I have cried almost every day – when putting James in the cradle for the first time, looking down at his sweet face while I was feeding him, laying down to sleep, in the doctor’s office, watching American Idol… My Tim is such a patient man. (You know it’s true love when your husband holds you until you have snotted and sputtered and turned puffy and red as you blurp out all your fears and failures.) Don’t let the bull freak you out. Hormones are inevitable. Since you can’t beat them, you might as well run with them. Fear is my worst enemy. Specifically, fear of SIDs or some other deadly thing. And it’s very counterproductive. [pullquote]I firmly believe that God is in control and when we open our hands and intrust those we care about so deeply to our Heavenly Father, we acknowledge that His ways are above our own[/pullquote] – sometimes resulting in painful, grievous circumstances. I praise God for our little James and have come to rest in the truth that we are both eternal. If we were separated on this Earth, we would be united again. That’s pretty much what makes me able to sleep (haha!) at night. Celebrate the small victories. Mark it on the calendar when your baby makes that first yellow, seedy poop. Do the happy dance when they sleep well. Take a mental picture when they smile, even if it’s just a reflex or gas. So, when your baby doesn’t sleep all night or he peed through a third outfit, you can remember those little victories and know there’s hope for a better tomorrow. Humility. I wrote about the difficulties of letting Tim serve me while I was pregnant a couple weeks ago. Well, that’s been nothing compared to what he, my parents, our family, and friends have done in the days following James’ arrival. Laundry, meals, errands, cleaning, burping, changing, holding and more has all been done by others so that we could sleep, shower, and adjust to being a family of three. It’s humbling to need/receive so much help. I am immensely grateful for those we love giving so freely of their resources. Unplug! My phone has been in Do Not Disturb mode for the majority of the past fourtneen days. Tim helped me turn off all my social media notifications when I went into labor and I haven’t looked back since. The need for undisturbed sleep and a precious little bundle that should get my whole attention has finally prompted me to do something I should have done awhile ago. [pullquote position=”right”]I may not be timely with texts or Facebook messages, but I feel less hustle and more love[/pullquote] (thanks for the catch phrase, Shauna!). I want to be present for my son and my family, not feel the pressure to write blogs or keep up with social media. Every baby is different. Just like every pregnancy is different, every little one is unique and special. Getting advice is great, but nothing can compare to you and your spouse getting to know your baby and their specific needs. Being a prayerful and intentional parent goes farther than feeding schedules and daily routines (those will probably change tomorrow anyways).